Considering purchasing the Chauvet Gig Bar IRC? Have questions? Ask people who've recently bought one. 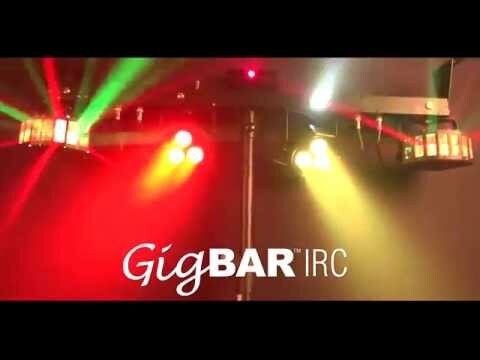 Do you own the Chauvet Gig Bar IRC? Why not write a review based on your experience with it. Best bit of kit I've ever bought if you do small venues you don't need nothing else in the lighting department it does it all in one easy set up if you have the money spare buy it worth every penny. This product is so easy to set up and just what we were looking for. This product is really good - exactly what I had hoped for and so easy to use. I have tried it using DMX and the IRC controller. The latter makes it really simple to use and is ideal for gigs - providing you don't misplace the controller!! Looks great on stage for small to medium gigs and provides a complete package. Light to carry you can have the Gig Bar working within 5 minutes. My thanks to the staff at djkit who provided excellent service and the product arrived very well packed the following day. its a good light. not good for larger gigs. the hand remote is to small and flimsy and the foot control is total rubbish. have to keep taking the key lock off to put in the bag/box every time and thats annoying big time. You cant keep the side brackets on so if your wanting to use them then keep this in mind. cant understand why the uk laser only has green but the american one also has red when america has firmer laser laws than the uk does? thats odd! it is a good light but not worth it current price £300 would be more realistic. you dont have a much control over each light as you may think unless you use a dmx control on it. if your a party dj like myself and dont want to carry lots of kit then go for it! Compact .. versatile .. effective! Quick to set up and very bright! This rig is ideal to use if you are in a small venue with limited setup time. It goes up and is ready to use in less than 5 minutes and the effects are all you could need for something like a birthday party. A couple of downsides: the antenna doesn't stand up very easily on the foot switch and the auto modes aren't brilliant. The infrared remote is a little awkward to use. But once it's on the right mode, just let it run! It is also DMX compatible which offers a wider set of customisation options. I bought 2 of these, they are well made professional units. The are perfect for kids parties where you have not got a lot of time to set up and tear down and they are perfect for adult parties where there is not a lot of space. We did a 30th birthday party at a restaurant last week and these lights where perfect for the size of the venue, if its a large hall your doing your gonna need more lights. Good array of lights to get you going as a starter kit or as supplementary. I found the lights to be a lot smaller than what i expected. Excellent unit, although I find the par cans pretty bright which is kind of expected from a par can. Brilliant bit of kit, quick to set up and comes in a really nice case. Well worth the money. Don't own one? Well you should! Had never really consider one of these but had the chance to see one at the DJkit show room and was blown away at how awesome this fixture is. This a great piece to have for those smaller gigs, no more carting around large amounts of lights, cables, controllers etc instead its all in 2 bags. Everything you need is a tight compact package. 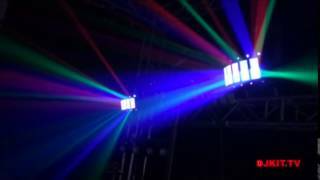 Having 2 of these linked together would provide a fantastic lightshow for any size event. I will seriously be considering adding to these later in the year. Great set up with a fantastic price tag!!! Mobile dj. This light is great for a mobile jock it is very easy to set up the pars and kintas work very well (Pars can even be used as spots especially good for singers or wedding 1st dance), strobes are quite bright but with the included IRC-6 remote control these can be off, the laser isn't so good which I believe is to do with the key and the interlock, the interlock does not want to screw on properly it's as though it is cross threaded and the key and lock is very flimsy and these have to be taken off to close the case up so I feel these two items will not stand the test of time on the road. This was my 2nd bar as the first had to be returned because the laser did not work and I believe it to be the same problem as the key just went round and round. The laser seems to be fine on auto but when on sound the laser is not very responsive even with the sensitivity turned up. Also I find the IRC-6 has to be held very close to the ir on the bar to work and it also changes the program on my ADJ up lighters which is annoying. I do not use the stand that comes with it as the fixture sits nicely on my ultimax stand (pole) and screws up tight. The light throws out plenty of light and fills a room I have also swiveled the laser so that it points behind the disco giving light behind which is good, I use a Kam Laser ultimate cluster on the other pole and I find these two lights give out plenty for a mobile after all it's only us dj's that are obsessed with lighting punters just see them as flashing lights. I have also not used the foot switch as I try to keep things to a minimum. All in all a very good effect that does the job but I worry about the interlock and key on the laser. Good value for money and dropped in price since I purchased. 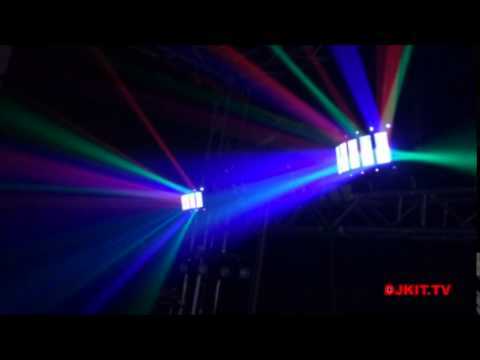 I have to applaud DJkit because the first bar as I mentioned had to be returned and DJkit done this with no hassle and delivered and collected next day they were superb throughout and any problems is down to Chauvet not DJkit to which I give 5*****. Roger. I purchased this item from the very helpful guys at DJ Kit. When I first opened the bags the kit comes in (Very good btw), I initally thought 'is that it? I took it out the following week to a party and was absolutely blown away!!! They lighting is supurb, and frikking bright! lol. Great coverage in the small venue i played in. I used these along with x2 megatrix and i felt it gave the desired effect. I also used smoke and the beams were great. Highly recommend! 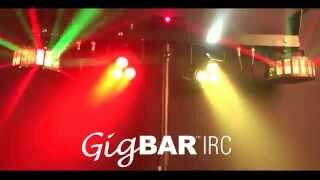 Seen a video for Chauvet Gig Bar IRC online or have you own video? Check out Chauvet Gig Bar IRC on DJkit.com!